Lancaster and Sabo are among seven students across the country selected to participate in the Normandy Scholars Program sponsored by the National WWII Museum in New Orleans. 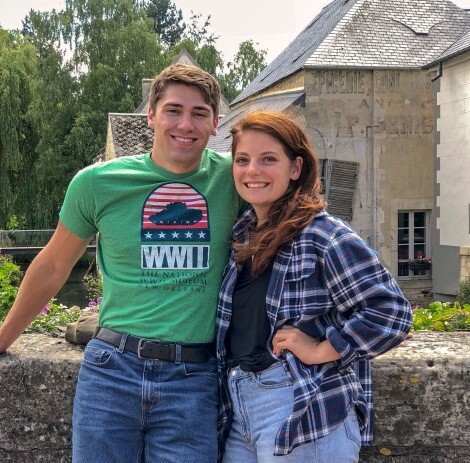 As part of the program, the OWU students traveled to France, where they spent time in Normandy visiting and studying major invasion and battle sites. Lancaster: “The trip was more focused on not only the American perspective of World War II, but also on the proceedings of the D-Day and the Normandy invasions. So, it only further expanded the knowledge and perspectives that I developed from Dr. (Mark) Gingerich’s Hitler and Nazi Germany class. “On this trip, I was able to do teaching with a history professor from New Orleans. It was through this discussion that I realized I wanted to be a community college professor at some point – not just a high school history teacher. I am not sure if I would have this realization if it weren’t for the connections and discussions I made on this trip. Sabo: “I heard about (the Normandy Scholars Program) when I was in New Orleans presenting my paper at the PAT (Phi Alpha Theta) Honors Society Conference and jumped at the opportunity to go overseas.